All light is made up of a spectrum of different colors, which correspond to different wavelengths of energy. The screens on digital devices have a higher proportion of high energy visible (HEV) blue light. The higher the energy, the more it can affect our eyes. Blue and violet light is the highest energy on the visible light spectrum. Prolonged exposure can strain and even damage our eyes. The Schepens Eye Institute demonstrated that a low density of macular pigment may represent a risk factor for AMD by permitting greater blue light damage. Blue light causes less contrast to be visible to the human eye, this causes more strain on our eyes. This is particularly common with people who work most of the day on the computer. Nowadays, most of us spend many hours a day sitting in front of a modern TV, computer screen, tablet, or smartphone. The light from the screen of these digital devices has adverse effects on our retina, and the long-term effects are still unknown. If you spend hours a day in front of a screen, sooner or later, you are likely to feel discomfort in your eyes including soreness, fatigue, and blurriness. At Advanced Eyecare Optometric Center in Irvine & Dana Point, California, we provide our patients with sophisticated blue light blocking lenses that can shield your eyes from direct exposure to blue light. Is Blue Light Always a Bad Thing? Sunlight consists of various colors of light. This includes orange, yellow, red, green, indigo, blue, and violet light. When combined, they form white light. Each of these colors corresponds to a different wavelength of light. The shorter the wavelength, the higher the energy. Blue and violet light have the shortest wavelengths on the visible light spectrum, sitting just below the ultra-violet wavelengths in terms of energy output. This is what we expose our eyes to whenever we stare at the screen of our digital devices. Prolonged exposure strains your eyes, messes with your sleep cycle, and likely causes serious long-term damage. No. Some blue light exposure is important as it helps regulate our sleep and helps stave off depression and Seasonal Affective Disorder (SAD). The best way to get helpful levels of blue light is to go outside during the day and spend some time out of doors. The problem with blue light from digital devices is that it is a lot of focused and continuous blue light in a way we don't experience in nature. It is this kind of exposure which is causing problems and worrying optometrists. Is my Digital Device Screen Dangerous to my Eyes? Blue light from digital devices and computer screens can reduce contrast. This causes digital eye strain. Dry eyes, fatigue, bad lighting, and the way you sit in front of your computer can also contribute to eye strain. Typically, you will feel discomfort, soreness, and perhaps blurred vision. At times, you may find it difficult to focus. Recent studies have shown that overexposure of the eyes to blue light can damage the retinal cells. This may lead to vision issues such as age-related macular degeneration which eventually leads to permanent loss of vision. 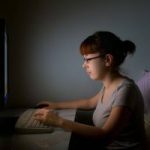 Exposure to excess blue light at night through indoor lighting, digital devices, or computer screens is proved to disrupt the circadian rhythms that regulate our sleep patterns. It tricks your internal clock into thinking that it is the middle of the day. This causes difficulty in falling asleep, insomnia, and daytime fatigue. 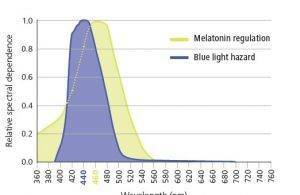 Research shows that overexposure to blue light reduces melatonin production. Melatonin is a hormone that affects our bodies circadian rhythms, which regulate sleep among other processes. Recent experimental evidence at Harvard University also indicates a correlation between lower levels of melatonin and the associated frequency of cancer. To help prevent long-term damage to your eyes, Advanced Eyecare Optometric Center provides state-of-the-art blue light blocking lenses and lens coatings for both children and adults. This will help protect your eyes from exposure to blue light and allow you to use your digital devices more comfortably and with significantly less soreness and eye strain. Our premium blue light blocking lens options include Zeiss Duravision Blue and Drive Safe, BluTech, Shamir Blue Zero, Hoya Recharge, and VSP Techshield blue. For our patients 15 and older, we also measure macular pigment density. BluTech pioneered the first fully-protective lenses for Blue Light. Originally marketed as computer lenses, they originally blocked all blue light, making things appear yellowish. The technology has since improved to the point that their near-clear lenses block the vast majority of Blue Light while preserving true colors. BluTech Lenses offer some of the best Blue Light protection on the market. The ZEISS DuraVision BlueProtect lenses filter out wavelengths of blue-violet that are shorter than 440nm — the range of light which is considered by eye doctors to be the most dangerous. By blocking only these very high energy wavelengths, the ZEISS DuraVision BlueProtect coating protects your eyes from retinal cell damage, phototoxicity, and disruptions to your sleep cycle while allowing beneficial frequencies of blue light through. You will be protected with clear and true-color vision while still enjoying the benefits of blue light. Shamir uses a unique polymer formula to produce these high-tech lenses. The Shamir Blue Zero High Index 1.67 and Trivex lenses block up to 98% of high energy blue light in the 415-435 nm range. The Shamir Blue Zero Polycarbonate lenses block up to 50%. This allows you to enjoy significant protection from blue light while still enjoying crisp, clear, and true-color vision. On average, Shamir Blue Zero blocks about three times the amount of harmful blue light as compared to standard clear lenses. These lenses from Hoya provides blue light protection along with excellent contrast and reduced glare for clear and comfortable viewing of digital devices in a way which reduces eye strain and improves color perception. VSP's anti-reflective (AR) lens coatings are a step up from standard prescription lenses by reducing glare, scratches, and dirt build-up. The TechShield Blue is a VSP AR coating specially formulated to protect against blue light. For more information about how our innovative blue light blocking lenses can help you, get in touch with us today. Our Advanced Eyecare Optometric Center optometrists and opticians will be happy to speak with you and recommend the lens which best suits your needs and lifestyle.